Dailybuzz.ch: Video Shows Moment Two Women Are Run Over By A Train!!! Video Shows Moment Two Women Are Run Over By A Train!!! Two women are lucky to be alive after being run over by a coal train while trying to cross a rail bridge. 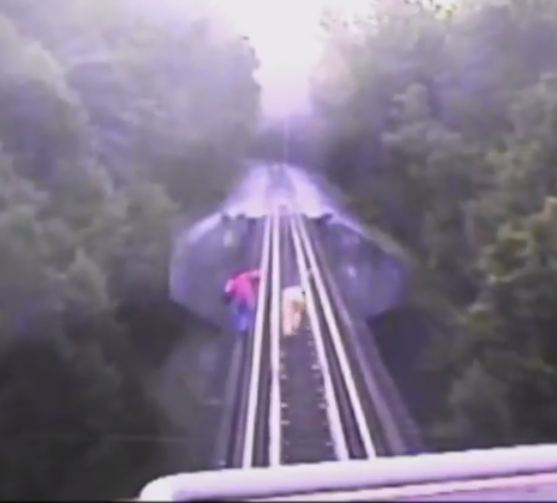 Security footage taken from the train cockpit shows the two women running for their lives along the 80ft high bridge in Indiana as the train approaches. As the coal train gets even closer one of the two women can be seen tripping over on the tracks, before they both drop down under the locomotive which has a 25cm clearance. Amazingly, the driver of the train reported that after it came to a stop both women emerged unhurt, with one shouting that she had simply stubbed her toe. The footage, which was shot on July 10, has been released by the Indiana Rail Road Company to warn people about the dangers of trying to cross railway bridges.